Thousands of residents have been forced back into emergency shelters after a volcano in central Indonesia unleashed its most powerful eruption in weeks. Mount Lokon, on Sulawesi, started erupting at around 1035 local time (0335 GMT) on Sunday. It spewed hot ash and smoke 3,500-metres (11,500ft) into the air, according to reports. Before the eruption, residents had been returning to their villages along the mountain's slopes, despite warnings to stay away from the crater. They were forced back into cars and motorcycles and many raced down the slopes to makeshift camps near the base. 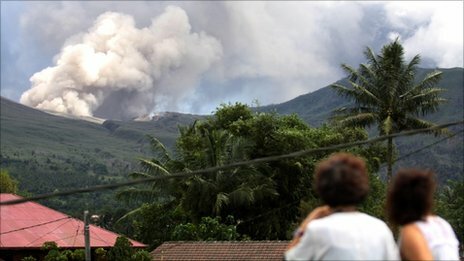 A local plantation worker, Henry Lalawi, described the eruption as "huge". "It sounded like a bomb and then I saw the crater burst, sending ash high into the air. "It was pretty awesome," he was quoted as saying by the AP news agency. The nearby international airport at Manado is operating normally but airlines travelling within 10km (six miles) of Mount Lokon's peak have been told to reroute their flights. There are 28,000 people living within a 3.5-km (two mile) evacuation zone which was established on north Sulawesi last weekend. Government volcanologists say the eruption is the biggest since late June. A series of blasts from Mount Lokon on Thursday and Friday claimed the life of a woman who suffered a heart attack as she fled. There are dozens of active volcanoes on the Indonesian archipelago which straddles tectonic fault lines known as the "Ring of Fire" between the Pacific and Indian oceans. Australians are shocked after a boat filled with asylum seekers capsizes on its way from Indonesia, and at least eight people die.